We are innovative, thirty-somethings with an eye for detail and a love for all things creative. We are a small but strong team who are design orientated and user focused. We produce creative brands, fresh responsive websites, strategy for social media and create fun graphic designs for businesses across the world. Working across a range of industries has given us an insight into the needs of our clients customers to help us create better user experiences. From education to real estate, fashion to retailers, social enterprises to community groups – we can cater for all. We are Colour Burst Studio. Being born into a competitive market in Lincolnshire (UK) in 2012, we learnt that collaborating with other creatives and adding more services would offer an all-in-one solution for customers. In 2016, we emigrated to Australia and have shaken things up to bring a new-look to the company. With team members in both Australia and the UK, Colour Burst Studio manages clients across the globe and comes highly recommended across all services offered. Our aim is to create high impact design solutions that make a difference. Whatever stage you’re at with your project, we can help you. We’re obsessed with making your stuff look awesome! It is our business to know your business, but we also take the privilege of getting to know you so that we may understand the people behind the business too. This allows us to provide custom solutions on a per-client basis, ensuring that you, our client, end up with what you want and need to succeed. Your logo will be the face of your business, and your ‘branding’ shows its personality. Through our design process we create unique, long lasting brands that match your business’ personality, its message, it’s vision and its goals. We create functional, Google friendly, responsive websites that will help new customers find you and look great on all devices! 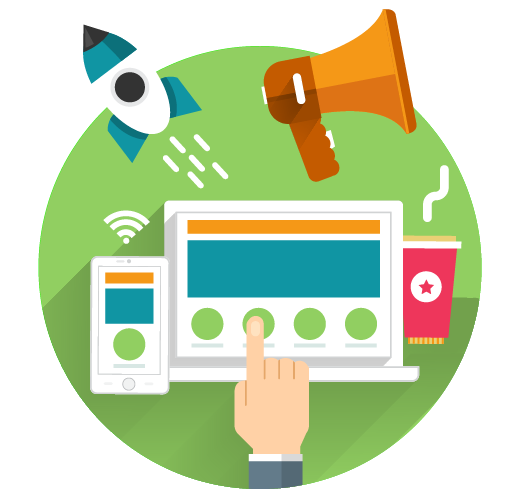 We make sure your website is user friendly, loads quickly and keeps your audience engaged. We setup and manage your social media on a day to day basis to engage with your audience and ensure your business achieves the exposure and reputation it deserves, letting you focus on running your business while we do the work. New to the world of blogging and don’t know where to start with WordPress? Or maybe you’ve been at it a while but want to focus on blogging, not updating your website all the time? Exceptionally helpful with lots of great ideas and suggestions to best market our business. Colour Burst Studio provides the personal service you want, with the professional result you need. Excellent communication and a speedy delivery of services, at a great price. I would not hesitate to recommend Colour Burst and hope to work with them again in the future. The team really understood my business ideas and turned them into reality with their fantastic creative skills, they have produced everything from my logo to my website, marketing and more. The execution is always perfect and attention to detail / speed of service is impeccable. I would strongly recommend Colour Burst Studio to anyone looking for a creative team. We worked directly with Lisa, her attention to detail and professionalism was outstanding. Three Creatives hired CBS to produce branding work for networking event #CreativePeople. The work that Lisa produced was not only an accurate representation of the event, but her willingness and enthusiasm to get exactly what we wanted on paper was a brilliant experience to be apart of. What a wonderful service – our website is professional and was no trouble to Lisa at Colour Burst Studio, whatever we wanted she did. Would certainly recommend the company to do any sort of design for you – they were superstars! Lisa has spent weeks carefully planning and design my bespoke wedding invitations. Received them today in the post and they are just beautiful! We are over the moon. They are the perfect addition to our special day! Thank you Lisa! She took all our design wants and turned them into beautiful custom designs! Delighted. Get in touch with us and we would be happy to answer any questions you may have.